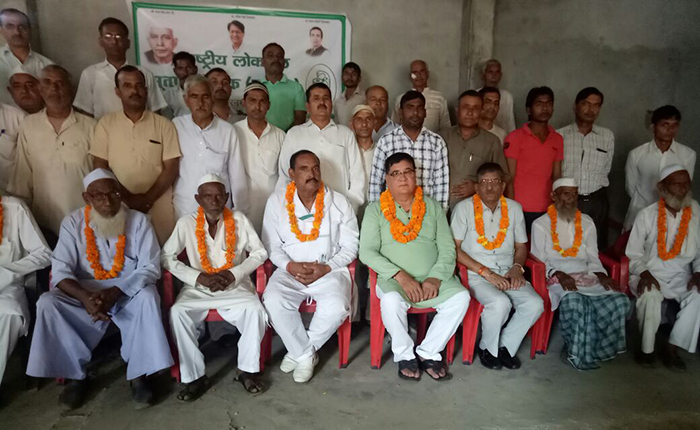 Chaudhary Charan Singh was elected to the Legislative Assembly of the United Provinces from Chaprauli in Meerut District in 1937, and represented the constituency in 1946, 1952, 1962 and 1967. He became Parliamentary Secretary in Pandit Govind Ballabh Pant’s Government in 1946 and worked in departments of Revenue, Medical and Public Health, Justice, Information etc. In June 1951, he was appointed Cabinet Minister in the State and given charge of the departments of Justice and Information, and later, Revenue and Agriculture departments in 1952. He was Minister for Home and Agriculture (1960), Minister for Agriculture and Forests (1962-63). He gave up the Department of Agriculture in 1965 and took charge of the Local Self-government department in 1966. On 1 April 1967, Chaudhary Charan Singh quit the Congress, and on 3 April 1967, Chaudhary Charan Singh was elected as leader of the Samyukta Vidhayak Dal and as the Chief Minister of Uttar Pradesh. In February 1970, Chaudhary Charan Singh became the Chief Minister of the State for a second time. His tenures as Chief Minister have been described by many as golden chapters in the history of the state of U.P. Chaudhary Charan Singh’s vision for social equity, and his ability to create political consensus on issues, resulted in important pieces of legislation in the State Assembly. Some of the notable achievements were the Debt Redemption Bill, 1939, The Consolidation of Holdings Act of 1953, and the Uttar Pradesh Zamindari and land Reforms Act, 1952, which resulted in the abolition of the Zamindari system throughout the State. The land reforms in the state empowered the tillers, provided the landless with ownership of land and thus created the enabling environment for their social and economic upliftment. The Agricultural Produce Marketing Bill, which he introduced in the assembly in 1938, was passed in 1964, and helped improve the market linkages for the farmers. The consecutive years of drought in 1966-1967 led the Central government to consider procuring food grains directly from farmers at prices, which would have been highly unfavorable to them. Chaudhary Charan Singh modified the central government plan to the advantage of agriculturalists by offering them a much higher procurement price than the prevailing market rates. The infrastructure he put in place for this led in time to the Minimum Support Price mechanism, which has today become an integral part of government interventions to provide pricing stability to the agricultural producers. Chaudhary Charan Singh was arrested on the night of 26th June 1975, with the imposition of emergency. He merged his Bhartiya Lok Dal with the Janata Party of which he was a founder member. Chaudhary Charan Singh was elected to the Lok Sabha for the first time in 1977 General Elections, and was Home Minister in the Janata party Government. In January 1979, he was appointed Finance Minister and subsequently elevated to the post of Deputy Prime Minister. He was sworn in as the Prime Minister on 28 July 1979. In his first address to the nation after taking oath as Prime Minister on 28 July 1979, Chaudhary Charan Singh Said --. "Our poverty has to be eliminated and the basic necessities of life made available to every single citizen. Political leadership of the country must remember that nothing mocks our values and our dreams more than the desperate struggle of our people for existence; nothing could therefore be more poignant than the look of despair in the eyes of a starving child. Nothing could therefore be a more patriotic objective for our political leaders than to ensure that no child will go to bed hungry, that no family will fear for its next day's bread and that the future and capacities of not a single Indian will be allowed to be stunted by mal-nutrition." Chaudhary Charan Singh’s terms in various capacities established his image as a fair, honest administrator. If he was strict in dealing with the 1953 ‘Patwari strike crisis’ in the state of Uttar Pradesh, in 1979, he recognized the nation’s rail workers contributions and awarded them with a bonus. Chaudhary Charan Singh’s interventions to reduce tax burden on, and input costs for the farmers, rural electrification (he provided for the electrification of 25000 villages in his Budget presented as the Deputy Prime Minister and Minister of Finance in 1979) his role in the creation of institutions like the NABARD, the Rural Development Ministry highlighted his intent, and are remembered today. Chaudhary Charan Singh, popularly known as Chaudhary Saheb, was a scholar of Indian economics. His books "India's Economic Policy - The Gandhian Blue-print" and "Economic Nightmare of India - Its Cause and Cure" are masterpieces on the subject. Some of his important publications include: Abolition of Zamindari, Co-operative Farming X-rayed, India's Poverty and its Solutions, Agrarian Revolution in Uttar Pradesh, and Land reforms in UP and the Kulaks. The wealth of statistics and information given in his writings show the depth of Chaudhary Charan Singh’s knowledge and his aversion to slogan mongering. He wrote a unique book on Indian etiquette in one of his incarcerations, which was published with the title “Shishtachar”. Chaudhary Charan Singh was a multi-faceted personality; a freedom fighter and patriot, an excellent administrator, a statesman, a thinker and scholar with a revolutionary vision, a man of character and integrity, and above all a champion of the interests of masses, especially the weak and the downtrodden in society. On 29 May 1987, Chaudhary Charan Singh breathed his last. His enduring struggle for truth and equality remains an inspiration to our countrymen. The Rashtriya Lokdal is a political organization dedicated to upholding his cause and ideals.